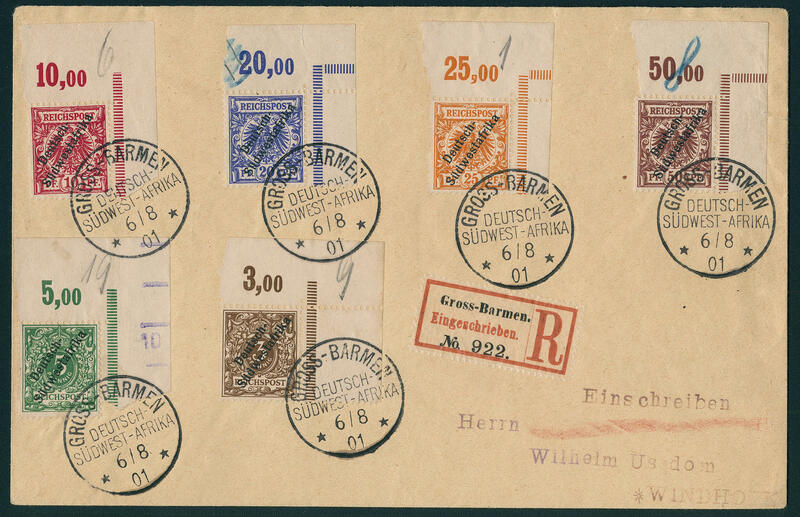 5196 ✉ \"expedition from red cross south WEST Africa\", black violet three line clear on nice fieldpost card with posting stamp \"German sea mail East-African Head line 29.3.05\" to Bayreuth with arrival postmark. This three line was on few flights as military cancel used (see Cook handbook). There are only few documents from this known. Expertized Bothe BPP. 5197 ✉ \"1. 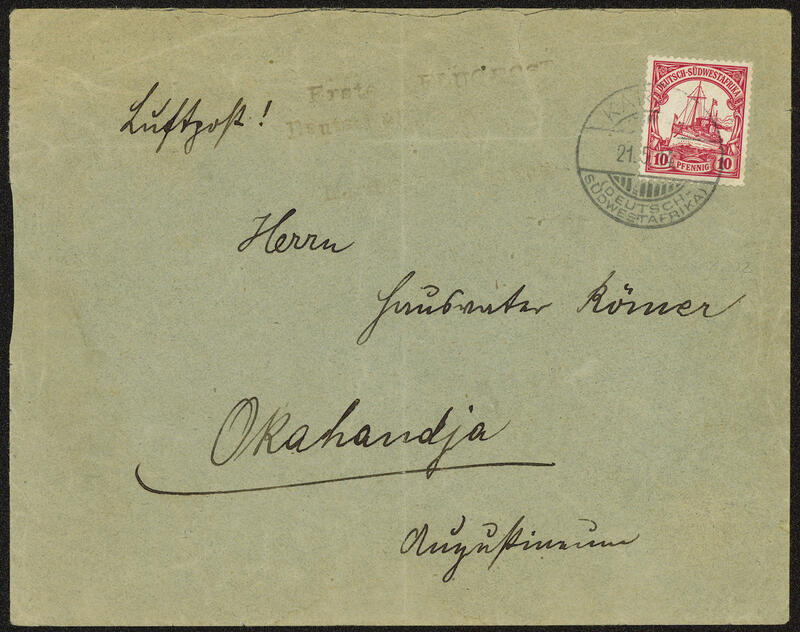 Airmail German Southwest Africa KARIBIB Windhoek\", violet black three line for retroactive taken to hospital post the rear Karibib-Okahandja, like always lightly struck on air mail letter, franked by 10 Pfg. Ships with postmark \"KARIBIB 21.5.14\" and on the back arrival postmark \"OKAHANDJA 22.5.14\". The cover with irrelevant traces of usage. 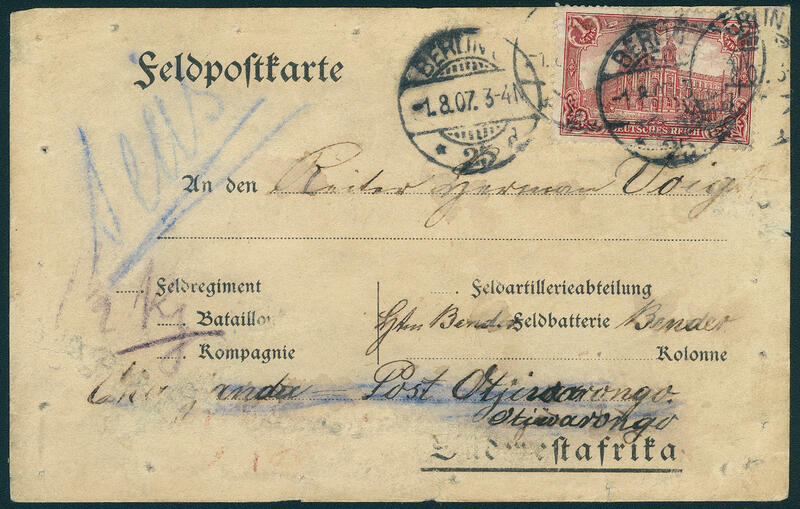 This is by far the rarest the 5 airmail cancellation, especially covers are nearly unknown. A great rarity of the German colonies! Photo expertize Czimmek BPP. 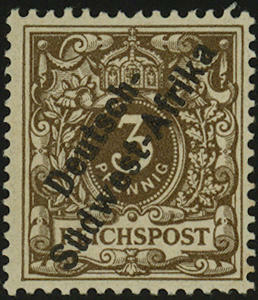 5198 ✉ \"PRINZENBUCHT 26.11.11. 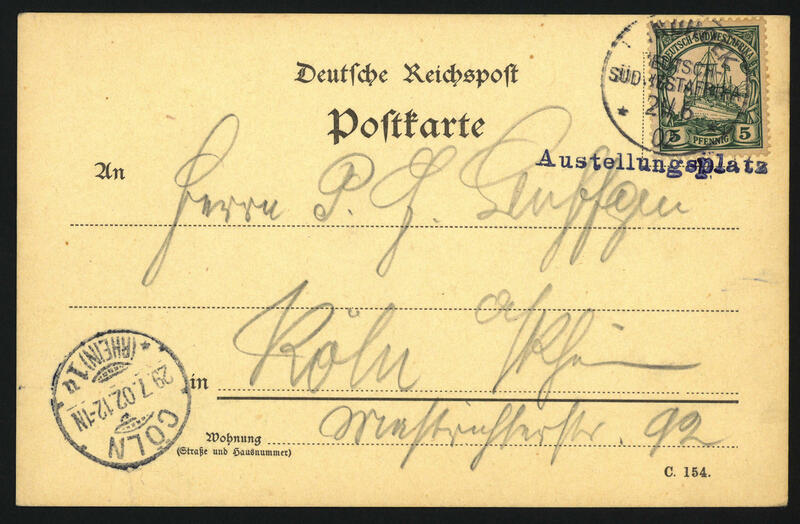 \", rare stamp clear on picture postcard, written in Prinzenbucht at the 22.11.11 to Germany. 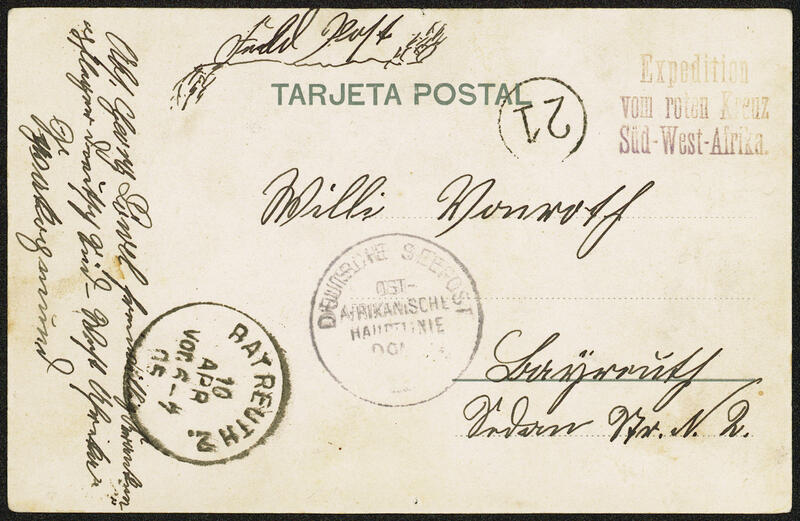 5199 ✉ \"WINDHOEK 21.6.02\" clear on private postal stationery 5 Pfg. 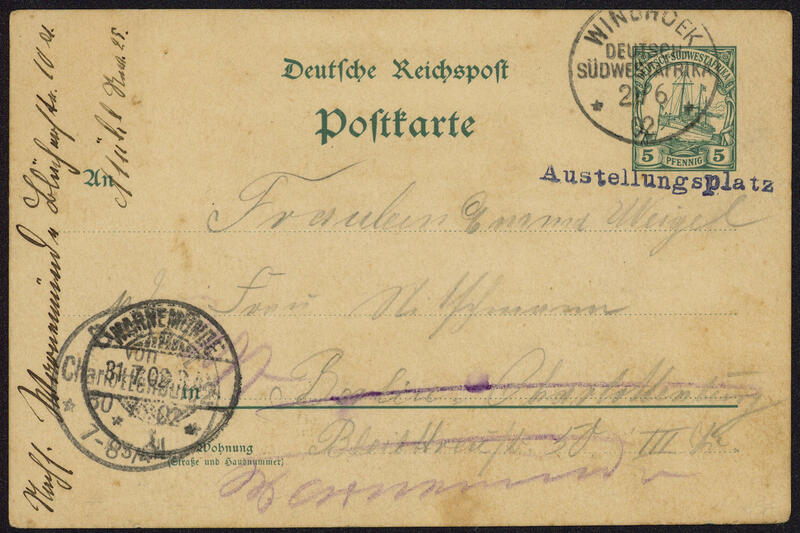 With additional scarce one-line cancel \"exhibition place\", with on the back additional imprint to Berlin, a little patina, forwarded to Warnemünde with arrival postmark. Rare! Signed Kruschel. 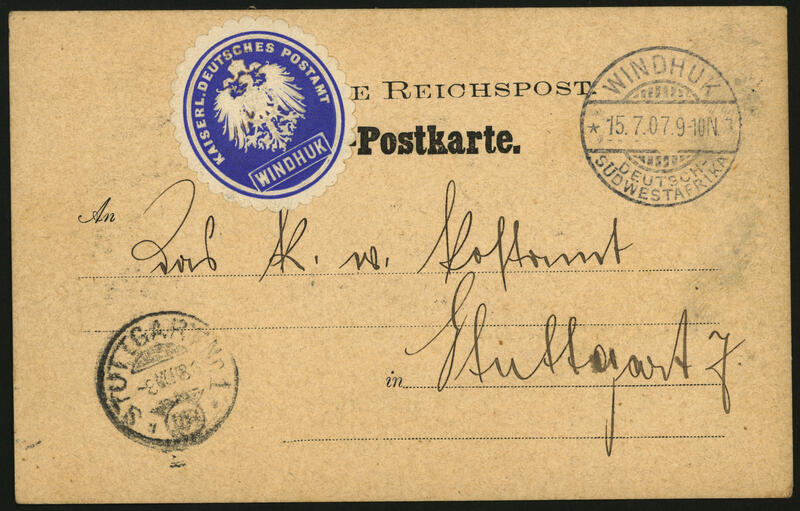 5200 ✉ \"Windhoek 15.7.07\", clear on faultless postcard with notification over an undeliverable package, which now redeemed was, with paper seal from imperial German post office to Stuttgart with arrival postmark. 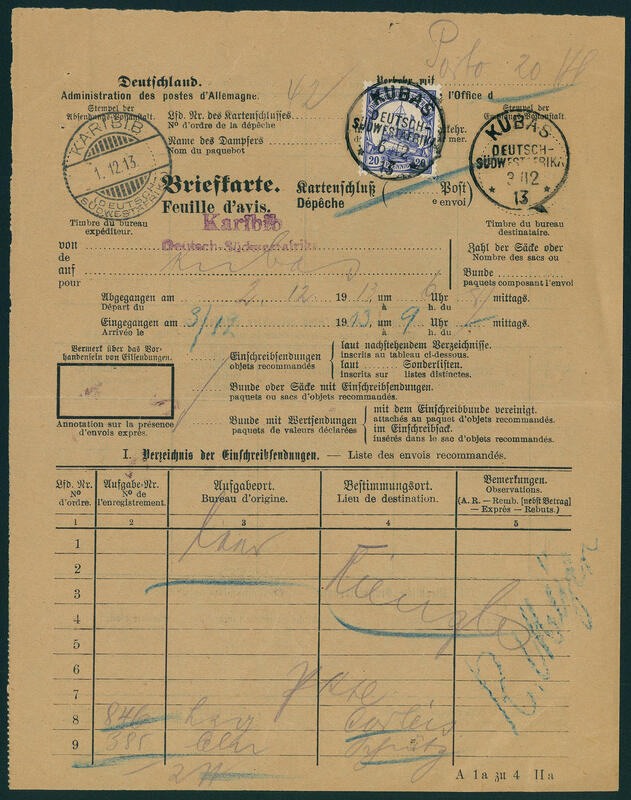 Extremely rare postal form! 5201 ✉ \"NEUHEUSIS 3. 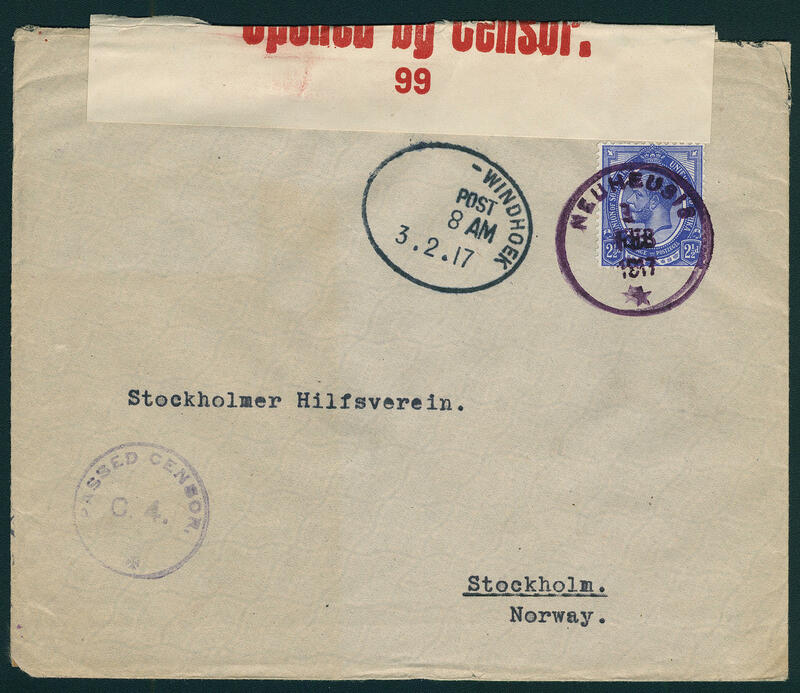 February 1917\", single circle postmark clear on commercially used cover to the inhabitant of Stockholm benevolent society with censorship stamp and censorship strip, as well arrival postmark. 5202 ✉ \"WINDHOEK 17.2.17. 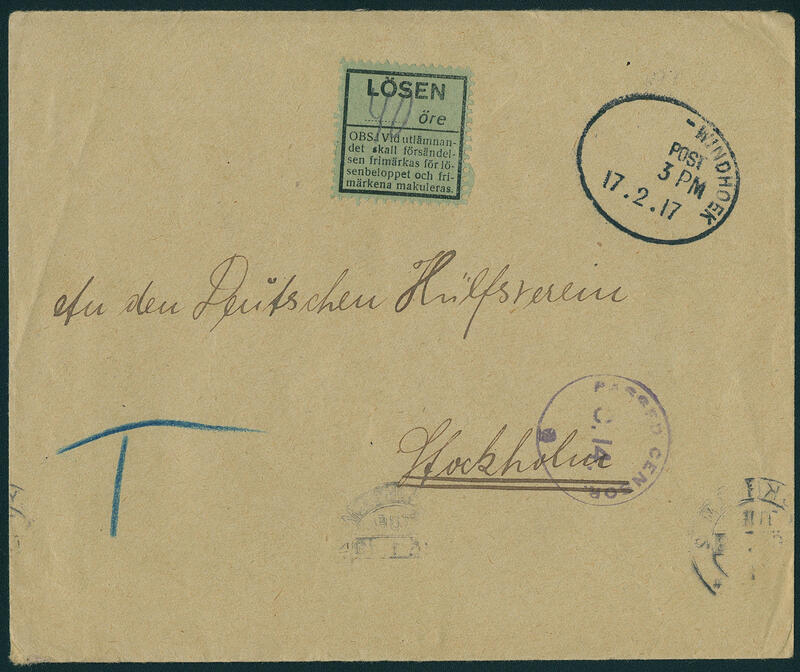 \", adapted railway cancel (TPO) on cover to the German benevolent society in Stockholm, without prepaid postage mailed with censorship stamp and on the back censorship strip, as well arrival postmark, postage due with Solve stamp over 40 Ã¸re. Rare! 5203 ✉ \"WINDHOEK 22.7.19. 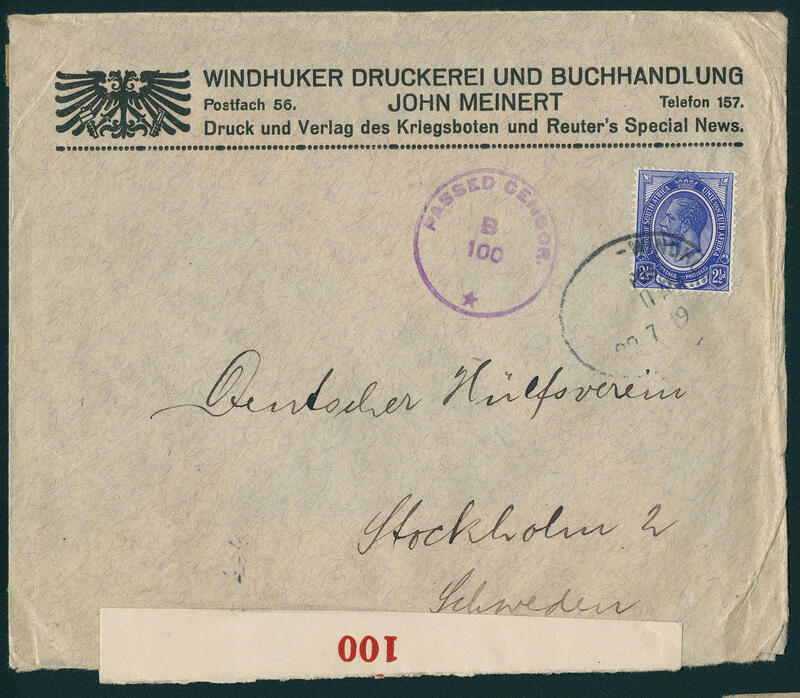 \", adapted railway cancel (TPO) on commercially used cover with South Africa 2 ½ P. And beautiful sender impression \"WINDHUKER printing plant and bookstore JOHN MEINERT\" with censorship stamp and censorship strip to Stockholm with arrival postmark. 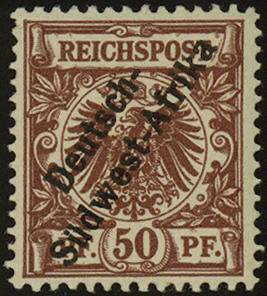 5204 ✉ 94AI Preprinted fieldpost card package address with German Reich 1 Mk. (Michel no. 94 AI) from \"BERLIN 1.8.07. 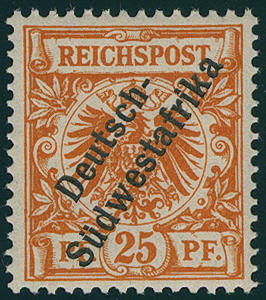 \" to a German soldiers in Okahandja / post Otjiwarongo Southwest Africa, as usual traces of usage. These package addresses, which from the homeland returned are, are rare, because these nearly always destroyed were! 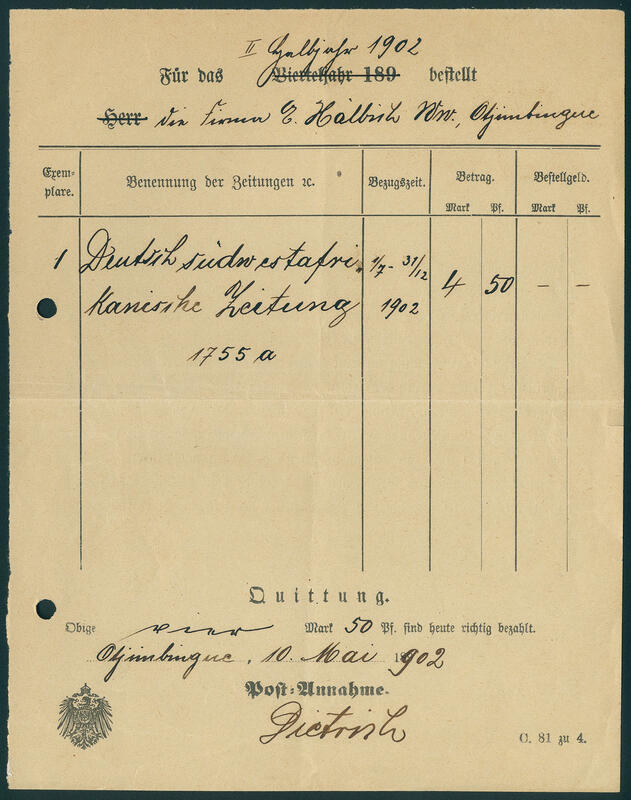 5205 ✉ Newspaper receipt 1902, rare form, executed about the subscription money for the German South-West Africa newspaper, executed in Otjimbingue, left as usual punched and twice folded, as far as excellent condition, it is only another form of this kind have become known, photo expertize Czimmek BPP. 5180 1/10ZS Overprint issues 1897 / 98, all 10 values in gutter pairs, wonderful fresh colors and well perforated, unfolded and in perfect condition mint never hinged, without any signs. As complete gutter series in this excellent quality almost never on the market. A top serie for the highest standards! The key value to 25 Pfg. With photo certificate \"faultless mint never hinged condition\" Jäschke-Lantelme BPP. 5181 1/4B,I/IIB 3-50 Pfg. Crown / eagle, Berner overprint, the very scarce special issue for the Universal Postal Union, wonderful fresh colors and very well perforated, in perfect condition unused with original gumming. Extremely scarce issue, the in almost all collections is absent! Photo expertize Bothe BPP. 5182 1bzS 3 Pfg. Pale ochre-brown, the good colour in the vertical gutter pair, wonderful fresh colors and very well perforated, unfolded and in perfect condition mint never hinged, without any signs. Photo expertize \"faultless mint never hinged condition\" Jäschke-Lantelme BPP. 5183 ✉ 05. Okt 3-50 Pfg. 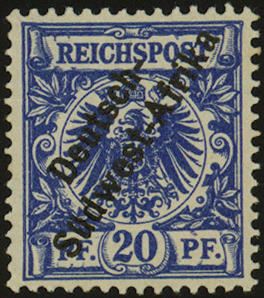 Crown / eagle with overprint \"German Southwest Africa\", the complete set from six values uniform from of the right upper corner of the sheet, wonderful fresh colors and well perforated in perfect condition, cover right with a small tear, two margin copies likewise with minimal tears (not the stamps concerning) with clear single circle postmark \"GROSS-BARMEN German Southwest Africa 6.8.01. 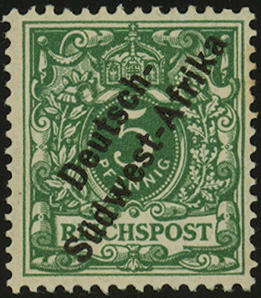 \" to Windhoek with arrival postmark. A fantastically beautiful letter and in this kind hardly once again to find! Photo expertize Jäschke-Lantelme BPP. 5184 9a 25 Pfg. 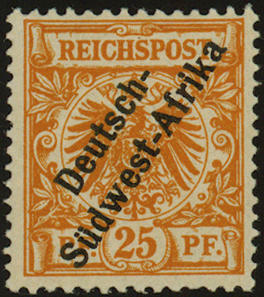 Orange with overprint \"German Southwest Africa\", fresh colors and very well perforated, in perfect condition mint never hinged, without any signs. Photo expertize \"in perfect condition mint never hinged\" Steuer. Michel 1200,- €. 5185 ✉ 12 5 Pfg. 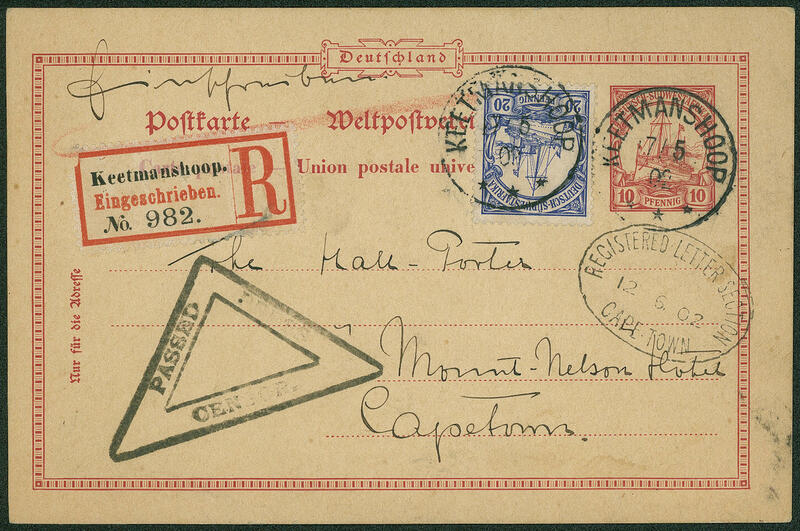 Ships with single circle postmark \"Windhoek 21.6.02\" and additional one-line cancel \"exhibition place\" on special card to the second agricultural exhibition, to Cologne with arrival postmark. Very decorative and rare. 5186 ✉ 12 5 Pfg. Ships on very nice special card to the \"2. 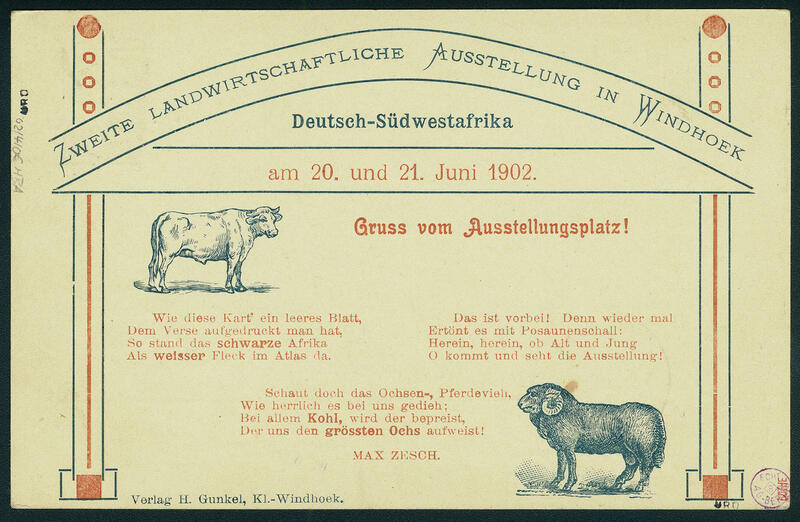 Agricultural exhibition IN WINDHOEK\" with postmark \"WINDHOEK German Southwest Africa 21.6.02. 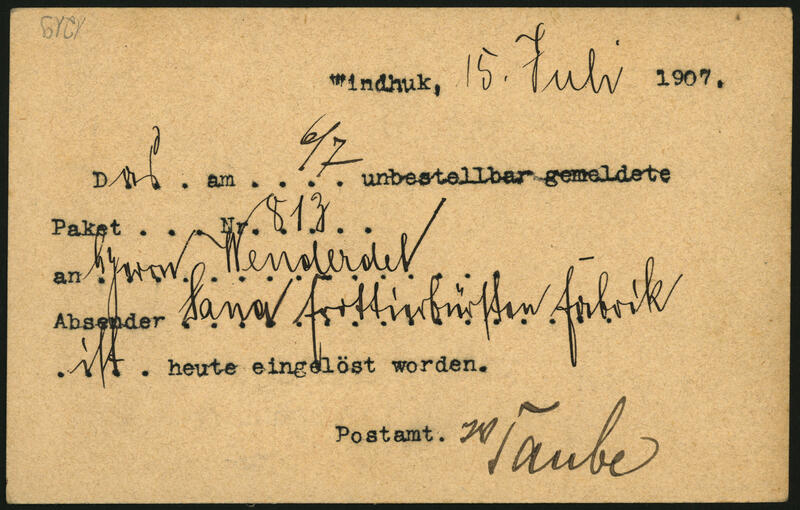 \" and additional single line cancel \"exhibition place\" to Cologne with arrival postmark. Very decorative and rare! Expertized Bothe. 5187 ✉ 13 10 Pfg. 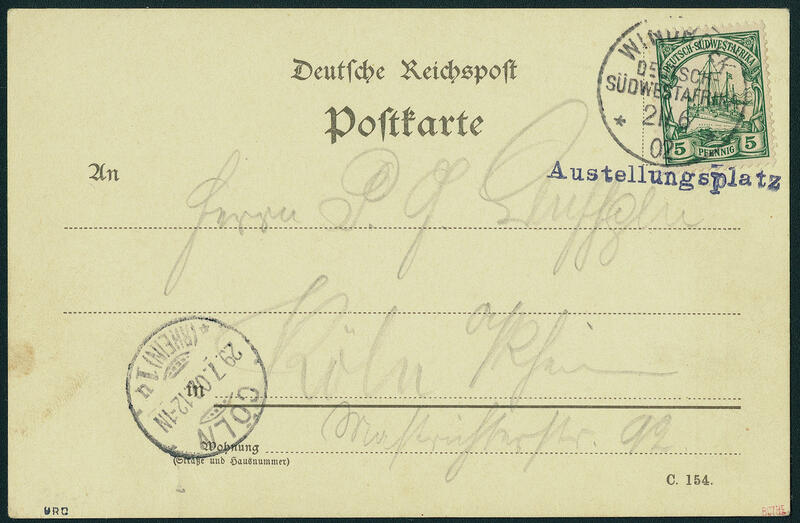 Ships unwatermarked, correctly franked multiple franking on commercially used cover from \"KEETMANSHOOP German Southwest Africa 30.9.07\" with handwritten notation \"RELAY\" to San Remo / Italy with arrival postmark. 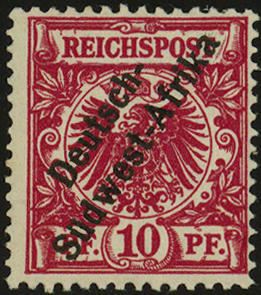 Sender adress was Dr. Sheriff, upper pharmacists in the protection troop for South west Africa. RELAY covers are almost only as army postal service known. 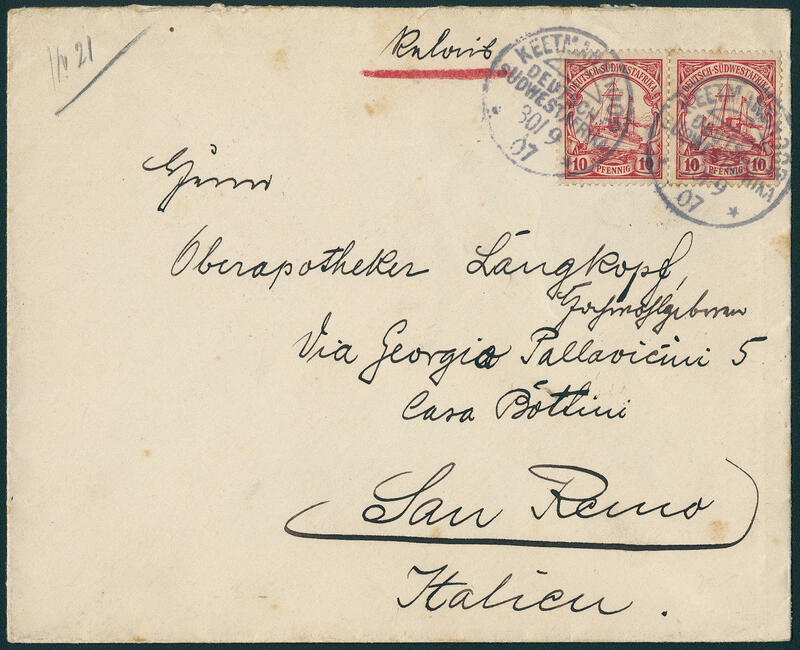 A franked cover abroad used places a postal history rarity dar! 5188 ✉ 14 20 Pfg. Imperial yacht on letter card, fresh colors and in perfect condition, form as usual folded, with clear single circle postmark \"KUBAS 3.12.13 respectively 6.12.13\" and posting stamp \"KARIBIB 1.12.13. \". A beautiful and rare form! 5189 ✉ 14 20 Pfg. 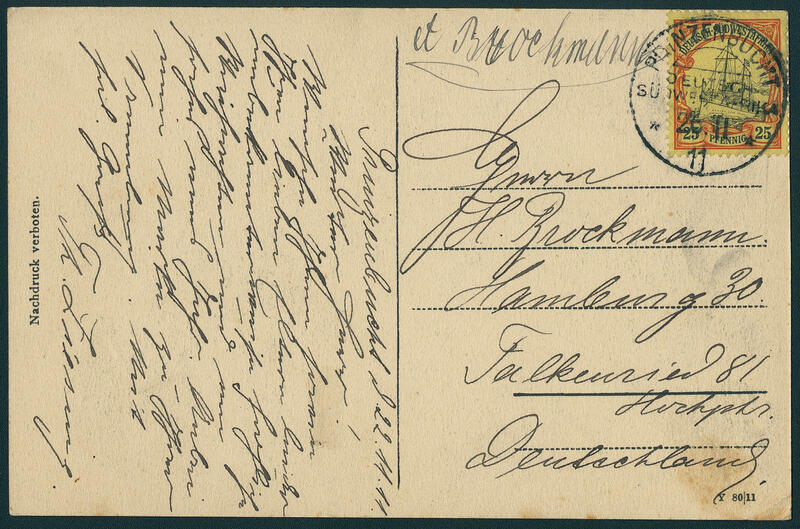 Ships as additional franking on postal stationery 10 Pfg., correctly franked as registered from \"KEETMANSHOOP 7.5.02. \", commercially used with triangular British censorship stamp to Capetown with oval entrance stamp \"CAPE TOWN 12.6.02. \". An impressive, in this kind possibly unique rarity from the time of the Buren war!